This Web site is dedicated to the history and photos of Otto Theodore Frasch, better known as "O. T. Frasch" for the way he signed his real photo postcards of Seattle and surrounding areas of the state of Washington from about 1907 to 1915. It is maintained by the children and grandchildren of his first daughter, Elsie Frasch. This is a picture of the Fourth Avenue street regrade, taken in October 1907. Many of Seattle's hills were dug out or washed away to flatten the streets and raise property values. Houses and businesses on the hills were forced to move, not always agreeably. 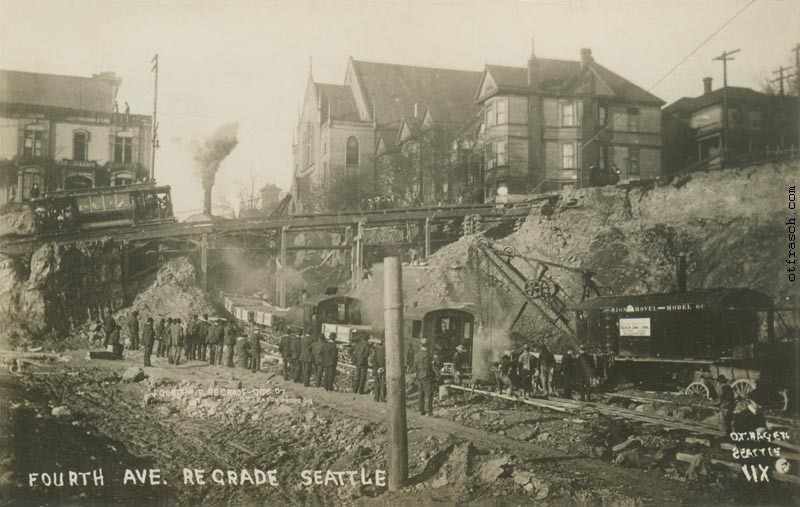 Note the streetcar traveling up the tracks on the left, the crews working next to the steam shovel on the right, the trams carrying dirt in the center, and the audience (dressed in their best clothes) watching everywhere - even from the streetcar. This must have been one of his most popular images, because he made many copies, even after the glass negative cracked. His wife and daughters lived in Lilliwaup (with larger pictures), along Hood Canal on the east side of the Olympic Peninsula. The nearby town of Hoodsport appeared in several pictures, along with the resort area of Lake Cushman (with larger pictures) before the lake was dammed to supply power just to the west. Although Otto spent much of his time separated from his family (with larger pictures), a number of his postcards showed included posed pictures of them. Other people (with larger pictures) also appear posed in his pictures, but we do not know their names. Outside of Seattle, Otto took pictures of Bremerton (with larger pictures) and Mt. Rainier (with larger pictures). Otto's pictures apparently were popular, as many of them were copied by pirates (with larger pictures). Eventually the pirates cut into his business, and he quit about 1914 to become a traveling salesman. At this point he disappeared from Seattle history. Like all professional photographers of the day, Otto used a glass plate camera to take his photos. Captions were written in reverse on the glass; sometimes he would slip (with larger pictures) and forget to reverse the letters, so that they would print backwards. Sometimes the mistake was corrected later, and sometimes (as far as we know) it was not. A number of his photos have spelling errors as well. Occasionally these were corrected on later prints. 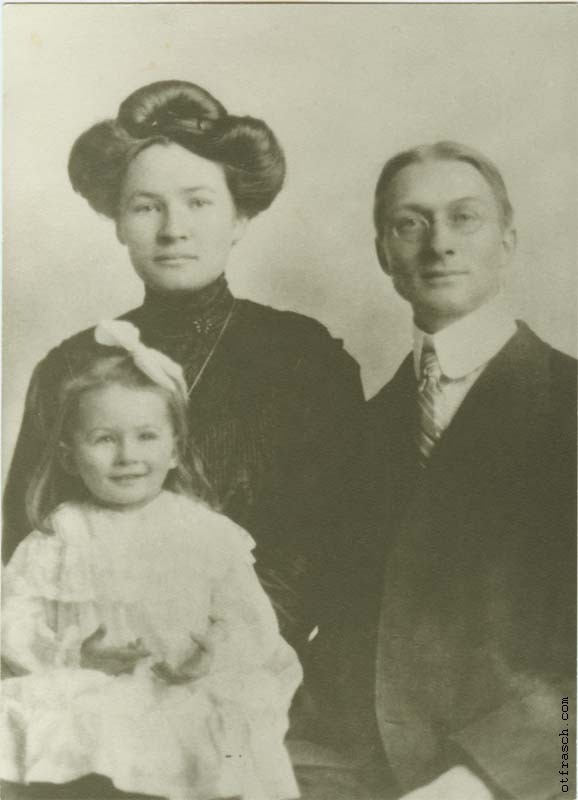 This is a picture of Otto Frasch, his first wife Marie (also known as Mary), and their first daughter Elsie. They had two more daughters, Marion and Ada, before Marie died in childbirth in 1918. Questions? Comments? Do you have O. T. Frasch photos or postcards to sell? Contact us! Even if an image appears on this site, we are looking for duplicates of some cards.